THE MOTH TRAP REFILLS PROTECT YOUR HOME FROM MOTH, WHICH DAMAGES CLOTHING MADE OF FUR, WOOL, NATURAL CLOTH, LEATHER. ALSO THE CLOTHES MOTH TRAPS CAN EFFECTIVELY PREVENT DAMAGE TO YOUR CARPETS AND UPHOLSTERED FURNITURE. - The wardrobe moth trap is non-toxic, doesn’t have any unpleasant odor, is insecticide free and eco-friendly. - Closet moth traps perfectly protect your clothes, carpets and upholstered furniture. - Our organic moth traps have a bright and attractive design. - Best moth traps are 100% safe for children and pets. - Sealed foil packaging allows pest moth trap to be effective for 3 months. After a setup put the trap anywhere near moth area. 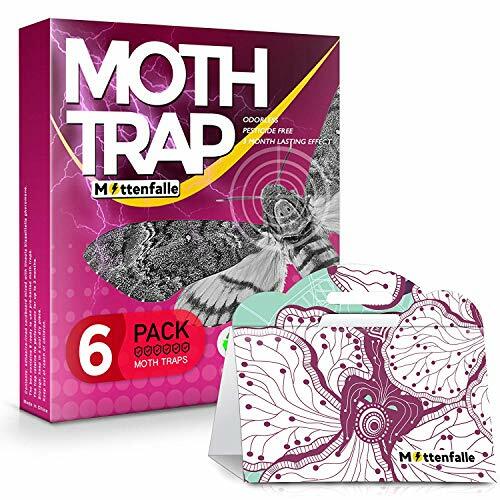 HIGHLY EFFECTIVE - Due to a special pheromone and non-toxic, odorless glue our moth traps protect clothes made of wool and fur, carpets and upholstered furniture very effectively. UNIQUE DESIGN - Our moth traps with bright and beautiful flower prints will compliment even the most elegant interiors. ABSOLUTELY SAFE - The pheromone moth traps are eco-friendly, made of natural components and insecticide free materials. 100% safe for children and pets. 3 MONTH PROTECTION - Sealed foil packaging helps our pheromone moth traps securely retain all their properties. This provides excellent results and lasting effectiveness. EASY TO USE - Just remove the protective film from the moth trap, fold it in a triangle form and put it in the place where moth is observed. If you have any questions about this product by Nicexx, contact us by completing and submitting the form below. If you are looking for a specif part number, please include it with your message.